This structure, repeated throughout the book (along with fuller taxonomies of the more versatile words actually, like, so, sorry, and whatever), makes lets us focus on a particular expression and become sensitive to its shabbier applications. In doing so we may, with a wince, recognise our own occasionally unwholesome use of it, or that of a friend or colleague. Other equivalences astutely analysed include feel = am (‘I hate when I do that. I feel so disloyal’); but = because (‘I’m behind on all my projects but I don’t like to stress out about it’); sensitive = insensitive (‘I think it’s so great that you volunteer. I couldn’t do it. It would make me cry. I’m too sensitive’); and should = won’t (‘Oh, you’re a poet? Yeah. You know, I really should read more poetry’). the mainstays of speech that can go unexamined, those throwaway words by which we reveal what we mean, no matter how hard we try not to. In hoping to ‘inject a little self-consciousness’ into our everyday discourse, her book succeeds in sharp and entertaining fashion. 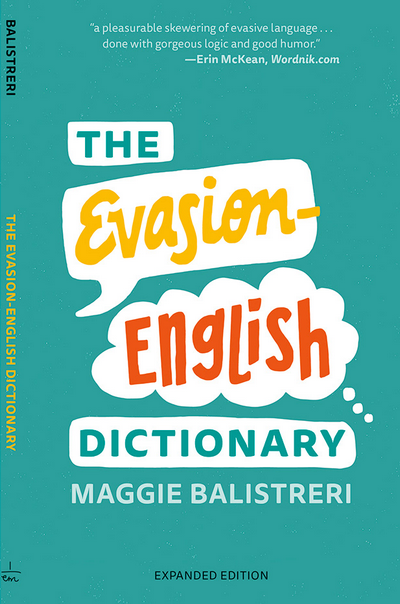 You can order The Evasion-English Dictionary from your preferred source via Balistreri’s website. This entry was posted on Monday, July 16th, 2018 at 7:04 pm and is filed under book reviews, books, humour, language, pragmatics. You can follow any responses to this entry through the RSS 2.0 feed. You can leave a response, or trackback from your own site. It’s in our nature, but some of that is changeable. We live in hopes and die in despair. Or as my mother used to tell me, wish in one hand and shot in the other and see which one gets full the fastest. This looks like an absolutely brilliant read Stan (albeit a bit short! Only 132 pages!) I’m going to try and track it down in a local library. An unrelated topic which for some reason came to mind when reading this is the deliciously subtle differences that prepositions make. “My wife was very good to me” (= she let me drink as much I wanted) vs “my wife was very good for me” (= she stopped me drinking and put me on the straight and narrow). I hope your library can help you out, Ian. It’s a short but invigorating read. Prepositions carry a lot of weight for their size. I notice this especially when editing or proofreading text from non-native-English speakers, for whom prepositions can be extremely tricky and misleading. I couldn’t find it in a library, but I ordered it online from Blackwell’s of Oxford. I was pleasantly surprised by how cheap the P&P was, by the way. I’ll definitely be going back to it in future, rather than Amazon.co.uk. It’s just out this month – probably too soon to appear in libraries. I avoid Amazon (and have done so for two decades), so I’m glad it’s available through other sites. Man, you are a lot more tolerant and benign than I am. When I got to the part about how “Balistreri is harsh on small talk, preferring to banish it if it does not lead swiftly to more substantial communication” and “like as a discourse particle is ‘worse than mindless’,” I would have tossed the book aside with a vividly worded remark about idiot peevers and never looked back. That particular bit was unfortunate, but it didn’t spoil the rest of the book for me. Hi Joe: Yes, she is essentially and explicitly putting words in people’s mouths, if only by implication in the particular method she uses. When she suggests that “I really should read more poetry” really means “I really won’t read more poetry” in the example provided, that’s exactly what she’s getting at. The speaker has no intention of reading more poetry, but they leave open the possibility in their discourse with the poet. This may be for politeness’ sake, or because they like to think of themselves as poetry-readers even if that’s an inaccurate perception. “I’m behind on all my projects but [read: because] I don’t like to stress out about it” presents a similar deception. The speaker is behind at work because they’re too relaxed, but they flip the logic so that they can imagine they’re behind at work for reasons unknown or unstated, while claiming or believing not to mind. But thanks for the review and for putting this book on my radar! It’s absolutely dependent on the speaker and circumstance. There’s no implication in the book that ‘should’ always means ‘won’t’ or that ‘but’ always means ‘because’, and if my review gave that impression, it’s my fault. Balistreri’s tongue is often in cheek, and some of her prescriptions are aimed primarily at herself. The book is generally humorous and not intended as a usage manual or a regular dictionary. Although you don’t gree, I think she’s right about like! It annoys me greatly, both as a filler (Australians do that a lot) or as a subsitute for as or as if, which most young New Zealanders and Americans seem to have never heard of! And that would appear to be the point of the book — to give aid and comfort to people who like to complain about other people’s use of their own language. Again, I am surprised this is something Stan approves of. Like has been used in place of ‘as’ or ‘as if’ since Chaucer, though today, as the American Heritage Dictionary notes, the usage has ‘a somewhat informal or conversational flavor’. Jespersen reported it in the prose of Keats, Emily Brontë, Thackeray, George Eliot, Dickens, Kipling, Shaw, and others. In a previous post about like as a conjunction (and as as a related hypercorrection), I wrote that it ‘grew in popularity in the 19th–20thC, after a period of relatively low use, and this probably fuelled the backlash’ – which unfortunately continues today. There’s really nothing wrong with it. My problem with it is that it’s ubiquitous and here in New Zealand has completely replaced as, giving rise to some very odd constructions! “The same dress like she was wearing” which sounds like some kind of pidgin to me but was said by an ‘educated’ upper-class lady about a cocktail party! Of course I know language evolves, I work in the area, however when it evolves in the direction of ambiguity and confuses my students, I tend to put much less stock in American dictionaries and American dialect than I do in practicality.